6 individual festive pies filled with mincemeat. 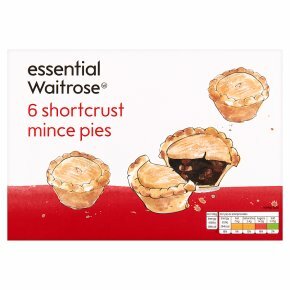 INGREDIENTS: Mincemeat (47%) (mixed vine fruits (sultanas, raisins, currants), sugar, apple purée, maize or wheat glucose-fructose syrup, water, humectant (vegetable glycerine), citrus peel [orange peel, maize or wheat glucose-fructose syrup, lemon peel, sugar, acidity regulator (citric acid), preservative (sulphur dioxide)], maize starch, palm oil, rapeseed oil, apricot purée, barley malt, acetic acid, gelling agent (pectin), citric acid, preservatives (potassium sorbate, sodium metabisulphite, sulphur dioxide), flavouring, acidity regulator (sodium citrates)), fortified wheat flour (wheat flour, calcium carbonate, iron, niacin, thiamin), palm oil, rapeseed oil, maize or wheat glucose syrup, sugar, dextrose, salt, raising agents (diphosphates, sodium hydrogen carbonate), preservative (potassium sorbate). For allergens, including cereals containing gluten, see ingredients in bold. May contain: milk and nuts.